Nomination Day is just around the corner. On Monday morning, Renee, our Campaign Manager, will drive down to Jubilee Centre and pass in the notarized nomination form and the $100 fee required to become officially nominated for Council in Ward One of the Regional Municipality of Wood Buffalo. Heather, Dylan and I will be heading down Highway 63 that morning, going to Edmonton for Dylan's second major leg surgery. So, while my council candidate colleagues are putting their respective campaigns into hyper drive, I'll be focusing my attention on my son and his post-surgery recovery at the Stollery Hospital. Things have been heating up in the weeks leading up to the official start of the campaign. There are over ten declared candidates in Ward One with several more expected to appear by the close of nominations. Our team has been busy fundraising, getting our signs and promotional materials ready and softly getting our message out. I use words like "our" and "we" because this campaign is really about a whole set of people who have a similar belief to mine. This is not a solitary venture, nor is it an "all about me" extravaganza. I like to think I represent thousands of hard working, dedicated folks, who love this community and want appropriate leadership at Council to chart the best path forward. These are people who I've worked with, played with, volunteered with, over 15 years of creating positive change in Wood Buffalo. Their faces and their voices, their experiences and their dreams are the foundation and the fuel of "our" campaign. Collectively, this is OUR HOME. This is OUR FUTURE. Want to help "us" and be a part of "our" campaign? Visit our website and send us a note. 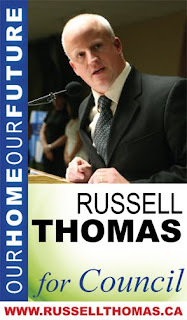 www.russellthomas.ca. If you don't mind my asking, who are the other candidates that have stated intention to run in Ward 1?